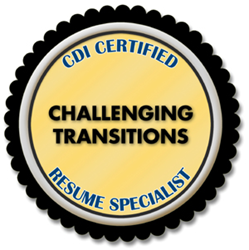 Career Directors International (CDI) has recently introduced its newest specialty designation category for the Certified Resume Specialist credential called Challenging Transitions. Professional resume writers who earn this credential will demonstrate that they possess the highest level of strategic skill in helping job seekers to position themselves to make major career changes. The CRS in Challenging Transitions is a unique spin on resume writer certfication because career change isn’t limited to a certain profession, but it is its very own niche and one of the most difficult skillsets a resume writer will master. Career Directors International (CDI), a membership-based business that helps resume writers and career coaches build six-figure-plus businesses, is recognized as the leader in professional resume writing training and certification. To earn one of their certifications designates that a resume writer has met rigorous standards in strategy, personal branding and job seeker marketing, keyword management, powerful writing, and visual design. 1. Make it easier for job seekers to navigate the maze of resume certifications. 2. Position resume writers to not only show their talents in the field, but to also have a way to designate their proven areas of expertise. Those resume professionals who earn the Certified Resume Specialist in Challenging Transitions (CRS+CT) will have proven that they have what it takes to help job seekers navigate this perplexing path. Resume writers interested in learning more can visit CDI’s Certified Resume Specialist page. Job seekers in need of resume or career assistance can utilize CDI’s Find a Career Pro database and search feature.